Hi everyone well I'm Perrin and yes I drive a Subaru 2002 WRX STI version 8. Hey bud you from the naki? 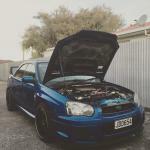 You herd about Subaru taranaki car club? Hi, yeah sure am. Not seen it, flick me some details?